In the last few months I’ve collected a lot of jewelry. Most of it came from two different sources: the pillowcase-full I found in April and the box-full (and extra bag) I found only a few days ago. 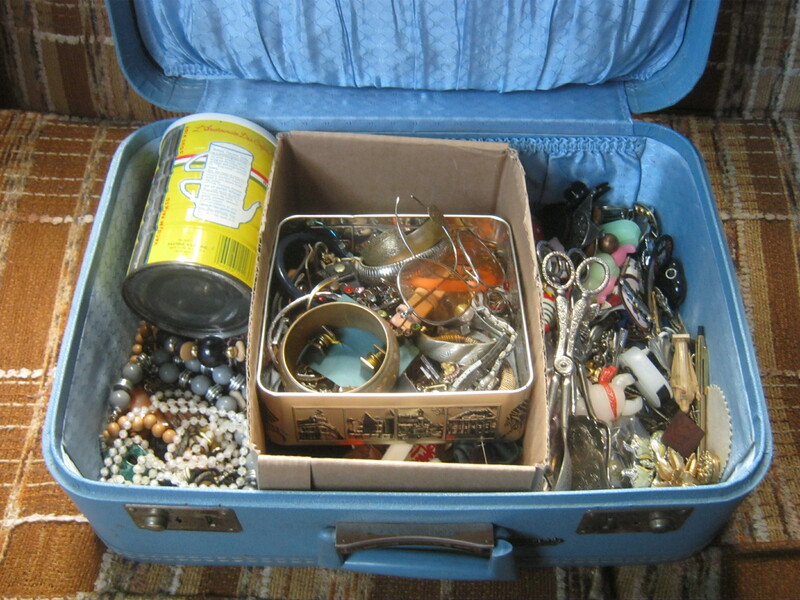 My friend had a yard sale yesterday and I decided to use my bike trailer to bring over some of the more portable items and that included all the jewelry I’ve collected. However, during the course of the sale (I made about 57$, for the record) I realized it was way past due for me to organize the madness that was my box of jewelry. There was a lot of good stuff but it was getting covered by the not-so-good – loose beads, un-matched earrings, impossibly tangled necklaces, and pieces missing jewels or other important components. Perhaps worst of all it was extremely difficult to find a pair of earrings even if I did happen to have both pieces. This is the box of stuff that wasn’t really saleable. It’s just as big (if not bigger) than the “good” box which goes to show how chaotic it was before I reorganized. 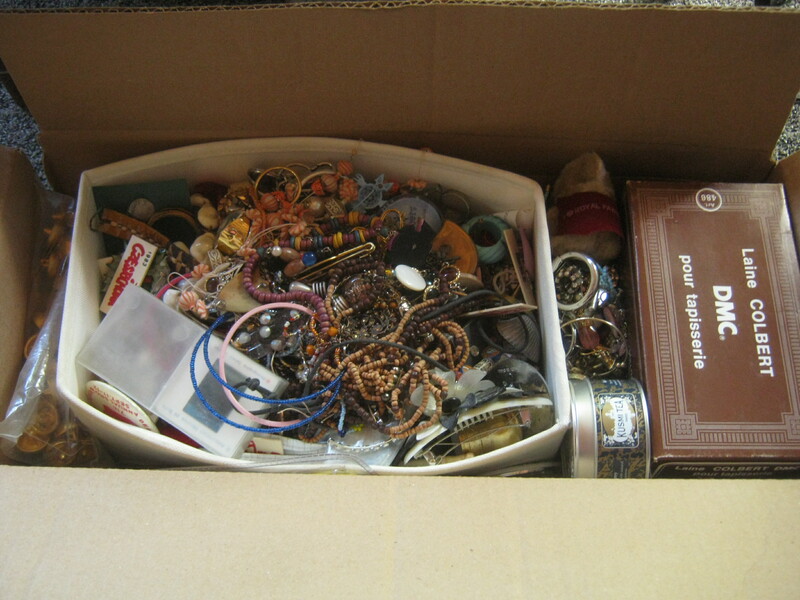 I didn’t want to throw this stuff out, as lots of people have interest in individual pieces for craft projects or to repair, so I contacted a local co-op with an interest in crafting and asked if they wanted the whole box. I got a message back this morning expressing a strong interest and I’ll likely drop off the goods sometime this week. I’m glad I was able to find a home for this stuff! These are a few pieces of gold that I’ll sell for scrap at some point. If the earrings had their match I would be able to sell them for a nice profit but alas. All in all it weighs 2.2 grams which is worth about 56$ when assuming that the group averages 14 karats. There’s a couple of stones which wouldn’t factor into that calculation. I’d guess that the real gold weight is a bit under two grams. I wonder though about that big earring on the left, it’s marked as 750 (18k) and has a pretty big rock inside and I wouldn’t be surprised if it turned out be a diamond. Diamonds are often set in high-quality gold and 18k fits that bill. I also found a bit of silver. The chain is nice and I’m going to save it to add to a silver pendant. The rest, though, are just scrap single earrings which I’ll eventually sell for weight. Overall this stuff is worth around 14$. Some people expressed an interest in the silver ring from the last post so I thought I’d show you a picture of the mark on the inside. It’s a pretty beautiful ring, if anyone has any info on the mark let me know. To me it looks like the one of the typical marks for sterling. 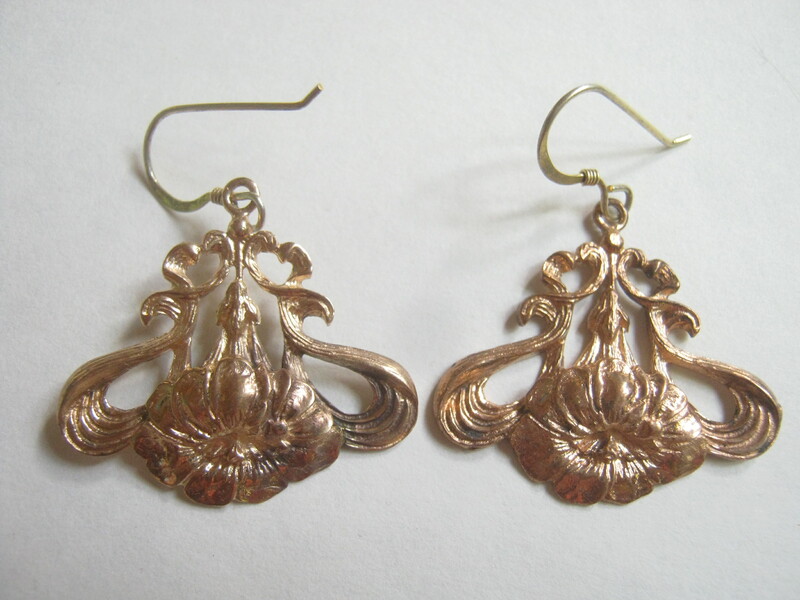 These earrings, oddly enough, are marked 925 (sterling silver) but they look more like gold. My theory is that they are vermeil, or gold-plated silver. Either way they’re super nice and vintage and should make me a nice profit. Here’s a couple of odd pieces. 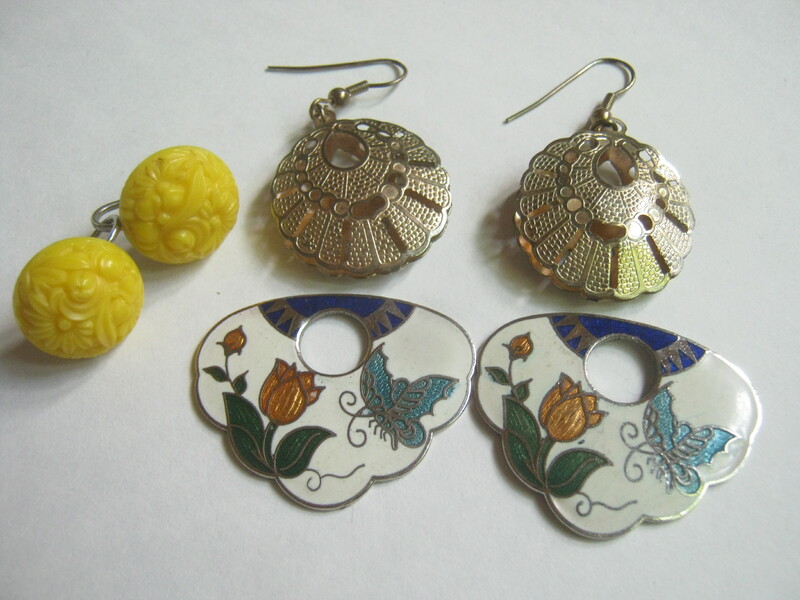 The one on the left is a gorgeous and definitely vintage sterling earring decorated with a nice enamel design. I only have the one, unfortunately, so I’ll have to sell it at the yard sale to someone who appreciates it as it is. I thought the design was worth posting regardless, perhaps it was made by a well-known designer? The other piece is a pendant with an intricate design that looks to be made with little stones. Here’s some “kitschy” stuff. The earrings on top are made by “La Rel.” The going price for their earrings on Etsy seems to be around 25$. The cow pin is made of a hollow plastic, I mostly think it’s funny and I think I’ll keep it for myself. I wondered if the yellow earrings were made of bakelite but I don’t think they are. The gold-tone earrings up top are definitely stylish. Both are pretty Etsyable. Does anyone know what the enamel pieces at the bottom are? I just don’t know why they have those big holes in them. Regardless, the enamel is pretty nice. Last but not least I took a liking to these old earrings. 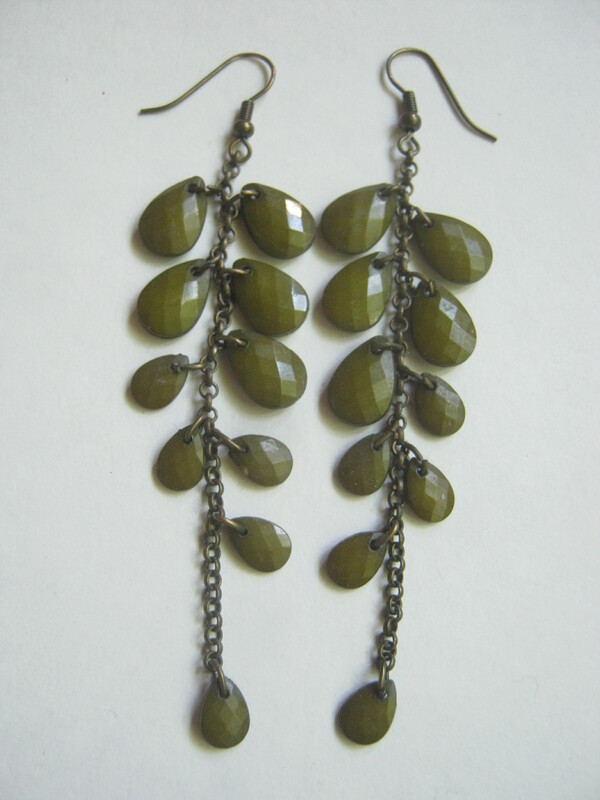 I like the earthy colour and texture of the beads. The (brass?) chain also contributes to it’s natural look. That’s all for now. I still have a bunch of little pins to show you but that’ll have to wait. Maybe tomorrow! In other news, this afternoon I sold the Marantz amplifier I found last month to a happy buyer for a cool 120$. Looking back I ended up making a pretty decent profit from that day’s finds. I sold the figurines for 95$ and a few of the books for a dollar each at my last yard sale – overall I made a bit over 200$ even after accounting for Ebay fees. Not too bad! Someone else is dropping by soon to look at the silver-plate candelabra I found the morning of moving day which I put on CL for 40$. Hopefully it sells! July 1st is looking like a good day too come to think of it, the hanging lamp sold for 50$ and with a few other knick-knacks and this theoretical sale my profit for that day’s finds exceeds 100$. Anyways, all this makes me realize that I really have to update my “Things I sold” section. Maybe… tomorrow? I am always amazed at what people throw away, I enjoy your blog very much! Thanks! 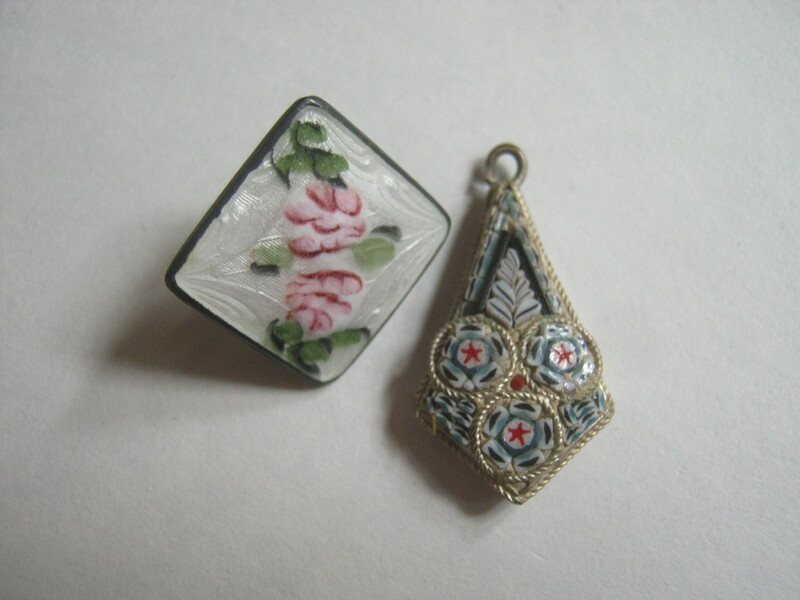 FYI the background pattern on the square earring with roses is called guilloche. The one next to it is micro mosaic usually made in Italy, I can’t remember the proper name off the top of my head, but google “Italian micro mosaic” will turn up lots of examples similar to that one. Thanks for the info! Those micromosiacs go for a decent price on Etsy, maybe I can get 20-25$ for it. 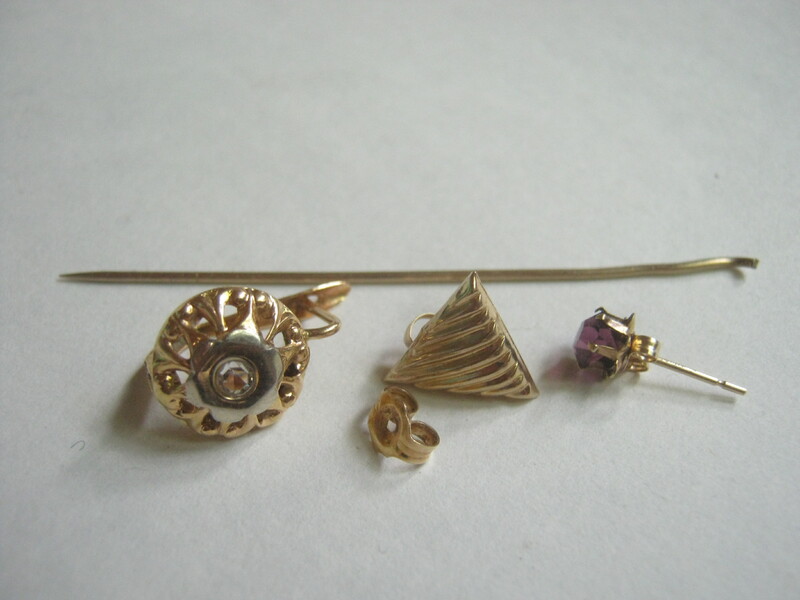 hi, something to consider on the single earings, if you or someone you know likes them, they are easily converted to a tie pin or a pendant. 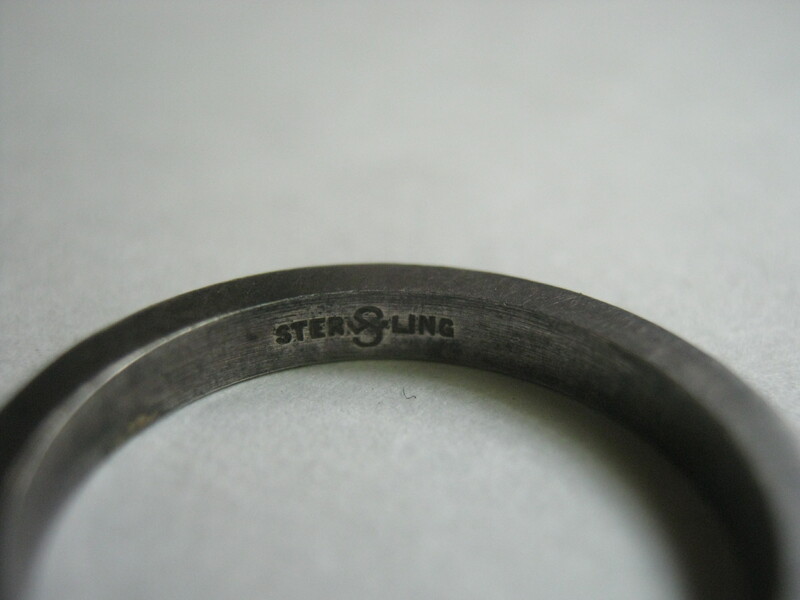 I don’t know anything about sterling marks, but that ring you showed us the “sterling”, it seems to have a symbol in the middle of the word sterling? if so, maybe that is a clue to maker? it still looks old to me. the “kitchy stuff” earings made by Le rel…you know that pink center looks like rose quartz, and the smaller very pale green stones look like jade. seem some very pale jade like that on some of those antiques shows. That’s true, some can be converted into pendants and such. Maybe I’ll put them in the yard sale box actually. I noticed that symbol too, it could maybe be a makers mark. I definitely have research to do before selling or cleaning this one. 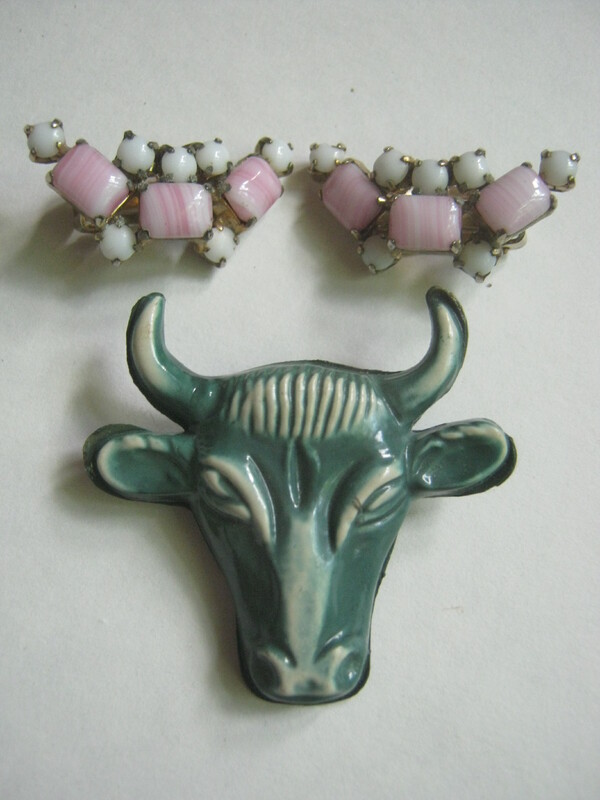 The Le Rel earrings, I believe, consist of milk glass (white) stones or cabochons, and the swirled pink and white look to be either agate or art glass stones. They’re gorgeous! Your diamond earring seems to be an amethyst to me since it is lavender,very pretty and also there are other women out there besides me who never wear pairs of earrings,I always wear two similar but different earrings. And amethyst is very popular.btw I am in the market for cuff links right now,singles or pairs so let me know if you find anything cool.I am very happy to pay for nice cufflinks. I have some cufflinks, some of which are singles. There’s some cool vintage ones as well. If you can to come check it out send me an email at thingsifindinthegarbage@gmail.com. You can also check out my collection of single earrings! you know, it occurs to me there is a lot of persons posting about single cufflinks/ ear rings..Maybe there are vast numbers of folks out there who have lost ONE cufflink or ONE earing..? 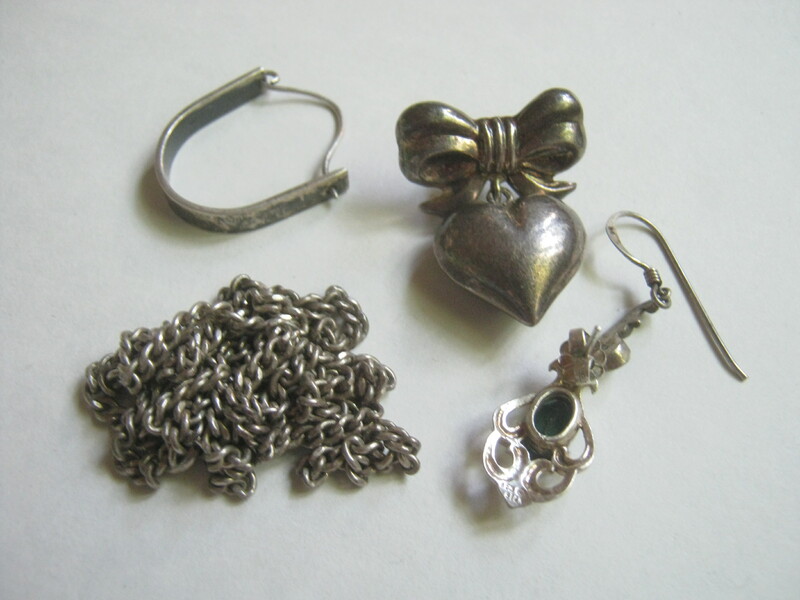 A suggestion I have for you is to do junk drawer jewelry lots on ebay or even etsy under supplies. One of my favorite things as a crafter is getting bags of random bits and pieces and figuring out ways to reuse them and create new items. 🙂 Love what you find. The big enamel pieces are add-on pieces that can be added to more modest earrings (such as the gold ones they are pictured under). Two pairs for slightly more than the price of one. Love following your blog – such interesting finds! ps. played catan with my parents tonight but they're new to it and have a little ways to go before I don't just feel like a mean monster playing against them! You’ve become quite a good researcher since you started this blog. Zut! The link does not work… so then just go on Google and type: bijoux micro céramique. Sorry!